ProtectaClear® is a solvent-based protector, which protects the long term metals for 3 to 4 years, both indoors and outdoors, but also contains resins that are highly resistant to salt and chlorine. It is a thin protective layer of a few nanometers thick. ProtectaClear® reduces maintenance and cleaning, repels dirt, stains, water, mold and algae. ProtectaClear® also reduces fingerprints and smudges on metals with bright polished. ProtectaClear® doesn’t crack, cracked or peel when properly applied and never turns yellow or discolored by exposure. Product Ready to use (no mixing, no waste). Completely invisible, maintains the real and natural appearance of the material to be treated. 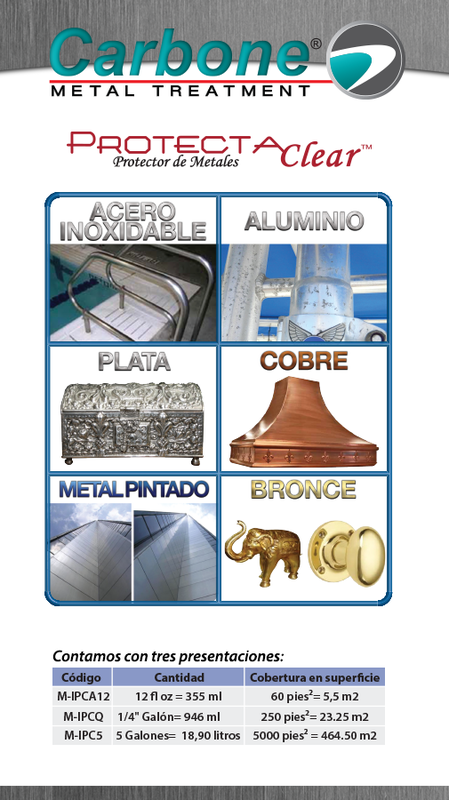 For use in satin and shiny metals: Stainless steel, bronze, copper, silver, anodized aluminum, polished aluminum, alloys and more. It can also be used on painted metals to protect them from salt or chlorine. It’s stable with exposure to ultraviolet radiation, so it remains crystal clear. Extremely durable, resistant to scratches and abrasion. Certified Hardness H8 – prevents electrolysis. 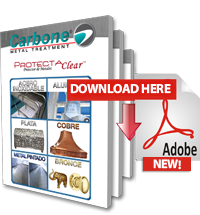 Protects the metal from oxidation, corrosion, salt water, salt, chlorine, acid rain, bleach, mold, waste bird, tea stains, etc. (Does not resist Muriatic acid). The Protective layer once dry is non-toxic and safe for food contact. Fast drying between 15-45 min, depending on the temperature. After 30 min of applied can withstand rain. Coverage of protection, approximately 1000 square feet per gallon with sealing and protection. While unopened, indefinite life use.